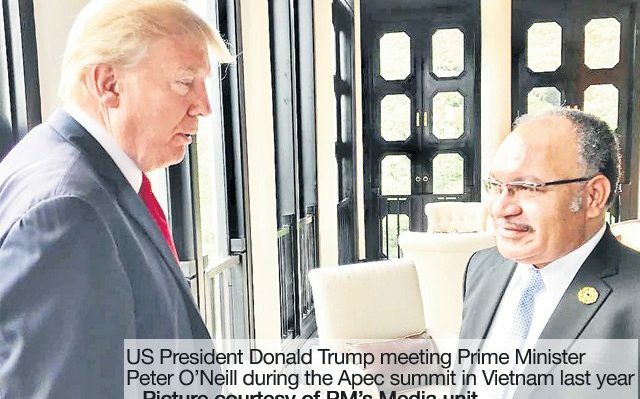 United States President Donald Trump’s attendance at the Apec meeting in PNG will be a “great honour”, Foreign Affairs Minister Rimbink Pato says. “Trump’s agreement to attend is a great honour for PNG. “We will treat that visit accordingly and show him the traditional warm hospitality for which our people are renowned. “We hope that – out of our close relationship with the president and our long-standing friendship with his country – our multi-level relationship will deepen further. The US Embassy in Port Moresby said it was planning on Trump’s attendance in November. However, public affairs officer Beverly Thacker told The National last night that travel plans were not confirmed. Pato described this year as one which would be historic for the country as it prepared to display its potential before the world at the Apec meetings, and in particular at the time of the leaders’ summit in November. “This Apec year is the perfect time for our international envoys to broadcast to the world that we are blessed to live in a position of great importance and that we are at the centre of a region of unparalleled dynamism and economic energy,” he said. “I have just returned from the United Kingdom with Prime Minister Peter O’Neill and I worked hard to deepen our connections with our Commonwealth cousins, most of whom are outside the Apec region, during the Commonwealth Heads of Government Meeting. “We want our trading network to spread worldwide. And with Brexit looking more and more likely to happen, we engaged in productive discussions about it with the UK. “British Secretary of State Boris Johnson accepted my invitation to visit Papua New Guinea, a token of our thanks for his warm hospitality at the meeting and also as a signal of our willingness to boost our relationship with the UK and the Commonwealth. Pato said he expressed willingness to enter into a Free Trade Agreement with the UK. “Just before I attended CHOGM, I had the pleasure of meeting with China’s Foreign Minister Wang Yi,” he said. “In Beijing, we discussed not only trade, investment and development arrangements but also our longstanding commitment to the One China policy. “We are looking forward to an historic time for us, a time when China will honour us with the presence of President Xi Jinping.